MANY THANKS TO PADRAIG O ‘ RUAIRC FOR CONTRIBUTING THE RINEEN AMBUSH ARTICLE. PADRAIG IS A WELL KNOWN AUTHOR ON THE IRISH WAR OF INDEPENDENCE PERIOD AND WE RECOMMEND HIS TWO BOOKS, “BLOOD ON THE BANNER” AND ” THE BATTLE FOR LIMERICK CITY”. In the early autumn of 1920 Anthony Malone and the other officers of the 4th Battalion had been ordered by the Brigade council of the Mid Clare Brigade I.R.A. to prepare an ambush for British motor patrols in the Milltown Malbay and Ennistymon areas. I.R.A. intelligence reported that a patrol of regular R.I.C. men and Black and Tans travelled in a Crossly Tender lorry from Ennistymon to Milltown Malbay at half past ten each Wednesday morning. The Brigade Council decided to attack the R.I.C. and Black and Tans the next Wednesday the 22nd of September. 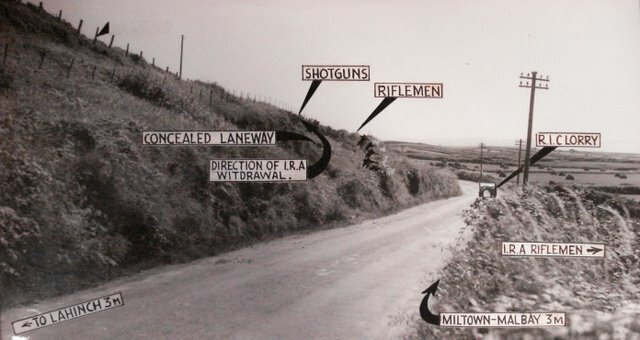 The countryside along the R.I.C.‘s weekly route was examined an ambush site was selected at Rineen about two miles from Milltown Malbay on the Ennistymon road. The site was a low cliff where the West Clare Railway rose sharply above the road commanding a good view of Lahinch and the surrounding coastline to the West. A curve in the road would force vehicles travelling from Ennistymon to Milltown to slowdown as they reached the ambush site. At four o clock in the morning O Neill and Neylon led the I.R.A. Volunteers towards Carrig at Ballyvaskin where the Moy company of the I.R.A. scouted the route to Rineen while the members of the attacking party followed on foot. Thomas Mc Donough drove a number of I.R.A. Volunteers from Ennistymon to meet the main I.R.A. force at the final assembly point about a mile from the ambush site at Rinneen. By six that morning fifty members of the I.R.A. had assembled for the ambush. O Neill posted sentries guarding the roads to Milltown Malbay and Lahinch while the main force of the I.R.A. settled down for a brief rest along the boreen leading from the railway line down to the roadway. O Neill and Neylon reviewed the ground with the different company captains and discussed the advantages and possible problems posed by their chosen position. Both the R.I.C. and British Army had a habit of suddenly changing the formation and strength of their transport patrols, if the strength of the R.I.C.‘s patrol was increased to more than one lorry, the attacking formation would have to be changed quickly. A number of signallers were posted along the hilltops near Rinneen and Thomas Moroney was placed in charge of the scouts posted on the roads leading to the ambush site; whose job was to watch for the approach of the R.I.C. patrol and to give advanced warning of a change its strength or the arrival of British re-enforcements. As daylight approached O Neill assembled the remaining forty I.R.A. Volunteers and with the help of John Joe Neylon and Patrick Lehane divided them into three different attacking parties. O Neill repeatedly explained to them in detail the plan of the operation until he was satisfied that each individual I.R.A. volunteer and section leader knew what their task was. To the north and west of the I.R.A.’s position at Rineen, open ground and fields swept towards the sea. To the south and east of the railway line small fields gave way to open bog land leading towards Milltown Malbay. Ignatius O Neill made an inspection of the I.R.A.’s arms and rejected a number of old shotguns. The remaining arms included the six Lee Enfield rifles, three Carbine rifles, a large number of shotguns a few revolvers. Anthony Malone and Patrick Kerins were given rifles ordered to take up position in the behind a low fence twenty yards directly to the north of the road, two other riflemen Stephen Gallagher and Sean Bourke were stationed about two hundred yards further west towards Milltown Malbay. These four had orders to prevent the R.I.C. and Black and Tans leaving from the lorry and taking cover in the fields, or from attempting to retreat towards the sea and back to Lahinch. O Neill gave the remaining rifles to John Joe Neylon, David Kennelly, Dan Lehane and Michael O Dwyer. Peter Vaughan an experienced ex-American soldier who had served on the Western front during the First World War was equipped with two hand grenades. These five men were to form the main attacking force and were stationed at the north western end of a small by-road which connected to the Lahinch road. The main body of I.R.A. volunteers were stationed about fifty yards further up this by-road where it crossed the railway line. This group commanded a good view of the ambush site being were in a raised position about forty feet above the level of the road at a distance of thirty yards. They were mostly armed with shotguns and were to act as a secondary attacking force with orders to cover the position of O Neill’s group. A number of large furze bushes had been cut to provide camouflage for the these men. At O Neill’s command, a single rifle shot from John Joe Neylon was to be the signal to open the attack. The riflemen in the first attacking group had orders to shoot the driver of the lorry to prevent it breaking out of the ambush position. Peter Vaughan was to throw his two grenades into the back of the R.I.C. lorry. If the I.R.A. came into difficulties they were to fall back to the railway line crossing the hill at Rineen and use it as a secondary line of defence while they retreated. It was now past seven o clock and the republicans settled down to a long wait before the expected arrival of the R.I.C. patrol. That morning eleven miles from Rineen, the 2nd Battallion of the I.R.A.’s West Clare Brigade were also waiting in ambush. Captain Alan Lendrum an ex-British Army officer from Tyrone had been appointed Acting Resident Magistrate at Kilkee by the British authorities. Captain Lendrum occasionally travelled to and from court in an R.I.C. Crossly Tender with a number of Black and Tans for security, but more often he travelled alone in his ford car. The 4th battalion of the West Clare Brigade watched his movements for several weeks, and decided to hold up Lendrum at gunpoint and commandeer his car. On the morning the 22nd of September while the I.R.A. lay in ambush at Rineen another group of I.R.A. Volunteers waited for Captain Lendrum at a level railway crossing at Caherfeenick two miles north of Doonbeg. As Lendrum drove towards the level crossing the gates were closed by two I.R.A. Volunteers and he was ordered at gunpoint to surrender his car. Captain Lendrum drew his automatic pistol but was shot dead before he had a chance to fire. This action was to have serious consequences for the I.R.A. ambushers at Rineen later that morning. After eleven o clock the I.R.A. ambushers hidden at Rineen heard the sound of a train coming from the south and hid from view behind ditches until the train had passed. As the I.R.A. 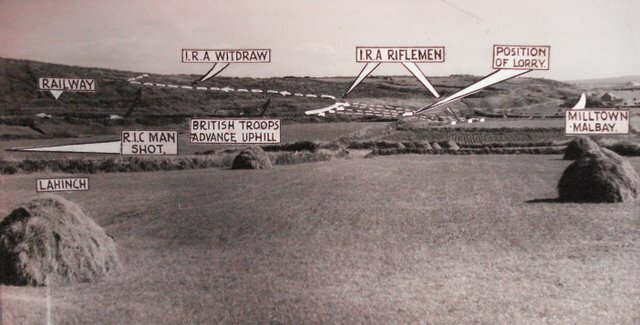 Volunteers scrambled back into position, the scouts watching the road from Lahinch signalled the approach of the R.I.C. John Joe Neylon could hear the sounds of the R.I.C patrol approaching when the I.R.A.’s scouts reached him and O Neill with reports that the enemy force was much larger than expected: “About noon, word was received from the scouts that the three lorries were coming from the Ennistymon side. O Neill had a quick consultation with myself and a few of the officers beside him. He had expected only one lorry and the plans had been made accordingly. His force was mainly composed of raw material and the ground did not lend itself to quick deployment. In the circumstances he decided, in view of the scouts message, to withhold fire. When only one lorry passed he realised a mistake had been made by one of the scouts.” The message ‘Police lorry coming.’ had been misinterpreted by one of the I.R.A.’s scouts as ‘Three lorries coming.’ The result was that the R.I.C.’s Crossly Tender was allowed to pass through the ambush without a shot being fired. Realising the mistake, O Neill dispatched Jack Clune, an I.R.A. Volunteer from Inagh, to cycle to Milltown Malbay and report on the activities of the R.I.C. patrol and to report back immediately if it appeared that the R.I.C. and Black and Tans had seen the I.R.A. Volunteers waiting in ambush and were calling for re-enforcements. O Neill moved the riflemen in the first attacking party into a more suitable position to attack the Crossley tender on its return from Milltown Malbay and made a few other changes to the I.R.A.’s other positions while he waited for Clune to return with news about the R.I.C. patrol. Clune returned from Milltown Malbay two hours later and reported that the R.I.C. patrol had not detected the ambush and their lorry was parked outside the R.I.C. barracks in the town facing the direction of Rineen. Clune’s information was confirmed when of the republican scouts signalled the return of the police lorry and the I.R.A heard the sound of the R.I.C. crossly tender approaching. A few minutes later the Crossley Tender re-appeared. It passed about ten yards beyond the laneway to O Gorman’s house on the northern side of the road when O Neill gave the order to Neylon to fire the opening shot. Peter Vaughan stood up and threw his first grenade at the police lorry, his second grenade missed and landed on the northern edge of the roadway exploding harmlessly. Already the I.R.A. Volunteers in the first and second attacking parties had opened fire blasting the R.I.C. and Black and Tans in the back of the vehicle with rifle and shotgun fire. Within seconds of John Joe Neylon firing the opening shot the attack had ended: “immediately all the party opened up. The attack was over in a matter of seconds. There was no reply from the lorry and our fellows rushed towards it to find five dead police men lying inside. One of the police managed to get off the lorry and had gone about three hundred yards towards Milltown when he was seen and shot by Donal Lehane of Lahinch in a field near O Connors house” A short distance away on the northern side of the road Anthony Malone had joined the first attacking section in taking aim at the driver: “The pre arranged signal shot was fired. There was an immediate volley from the different positions. I fired three or four rounds at the men sitting in the cab and next I saw the driver slump over the wheel as blood pumped from a wound in his neck. He seemed to be staring directly at Kerins and myself. The men on the other side of the road poured several rounds into the tender and, in a matter of minutes the attack was over.” As soon as the firing stopped O Neill gave the order to cease fire and search the vehicles. The I.R.A. searched the Crossly Tender and recovered a six Lee Enfield and Carbine rifles, six .45 Webbly and Scott revolvers, a number of Mill’s bomb hand grenades and almost three thousand rounds of .303 ammunition. After the weapons and ammunition were recovered the lorry was set on fire. Patrick Kerin rushed onto the roadside with Anthony Malone and began to search the bodies of the dead R.I.C. men and Black and Tans for intelligence papers and official documents: “When the firing stopped Malone and myself rushed over to the tender. I searched one of the dead men and, from correspondence which he had received from lady admirers in London, I learned that his name was Reggie Hardman, obviously a Black and Tan.” Reginald Hardman was the first Black and Tan killed in Clare, he was twenty one years old and came from East Finchley in London. He had served in the Royal Artillery Regiment before joining the R.I.C. The other five members of the patrol were all regular R.I.C. men; Constable Michael Harte from Sligo, Constable John Hodnett from Cork, Constable Michael Kelly from Roscommon and Constable John Mc Guire from Mayo. Sergeant Michael Hynes from Roscommon was fatally wounded in the ambush and died two days later. While the Crossly Tender and the bodies of the dead R.I. C. men were being searched, I.R.A. Volunteers sat on the roadside smoking and talking until Dan Kennelly, who had served in both the British Army and R.I.C., urged the men to get back up the hillside to safety quickly. The I.R.A. shared out quantities of the captured .303 ammunition and began moving back up towards the railway line crossing the hill. Seamus Hennessy heard the sound of lorries approaching from Lahinch and shouted to Stephen Gallagher, who had gone to collect the rifle and ammunition from the dead R.I.C. man who had tried to escape from the ambush, to hurry back towards the hill. Next Hennessey shouted a warning to a group of I.R.A. Volunteers who had halted below the first hill and indicated in the direction of the noise. A few minutes later a British Army lorry came around the bend in the road below the railway. The driver stopped when he saw the blazing R.I.C. Crossly Tender and the soldiers jumped out and rushed up the hillside towards the railway line. Moments later a second British lorry halted a short distance behind the first and more British soldiers poured out to pursue the I.R.A. Ten lorries of British soldiers had left Ennistymon to search for Captain Lendrum who had been killed by the West Clare Brigade of the I.R.A. at Caherfeenick near Doonbeg earlier that morning. Captain Lendrum’s wife regularly phoned the military and R.I.C whenever he was due to make a journey and when he failed to arrive at Ennistymon the British military had set out to look for him. As they approached Rineen they heard the distant gunfire from the ambush and saw the smoke rising from the burning crossly tender and members of the I.R.A. crossing the hillside. When the British soldiers appeared in view advancing toward the I.R.A. the republican scouts let out a warning cry of ‘Military!’ and O Neill gave the orders to retreat across the railway line back towards Ballyvaskin. A small group, including Ned Lynch, Michael O Keefe and the Bourke brothers, who had been separated from the main force of the I.R.A. and made off towards the sea shore in the opposite direction without being noticed by the British soldiers. As the British soldiers closed ground on the main force of the I.R.A. scrambling over the hilltop O Neill and John Joe Neylon stood their ground along the railway line to cover the others escape: “Those who had already been making their way towards the top of the hill, as well as the party who were starting to do so all came under heavy fire, rifle and machine gun from the newly arrived troops. … As the big majority of our men had only shotguns, they were of no use in meeting the British forces who, in a short time had reached the hilltop a quarter of a mile or so east of the scene of the ambush. There was only one course open to us and that was to use the riflemen to fight a rearguard action while the others with the shotguns were making their way to cover and safety on the Ballyvaskin side. Unfortunately only a few of the riflemen were available for this purpose. They included O Neill himself, Michael Dwyer, Patrick Lehane and myself. The other men with rifles had gone off in different ways and it was not possible to collect them. The four of us took up positions in a field adjacent to Honan’s house and engaged the military who were using a machine gun behind a stone wall at the corner of a field about three hundred yards almost due east.” Their opening volley felled the leading British soldier advancing towards them, and his comrades took cover in the heather. The four riflemen spread out and commenced rapid fire returning the captured British .303 ammunition to its previous owners at a generous rate. This gave the British soldiers the impression that they were facing a much larger group of riflemen. Seamus Hennesy was headed towards a gap in a bank when Patrick Vaughan shouted a warning to them ‘Don’t go out that gap, for they’re like to set the gun on it. Roll over the bank when I shout.’ When Vaughan gave the word the shotgun men tumbled over the bank while the British soldiers on the hill raked the gap of the bank and its edges with machine gun fire. With the British soldiers in hot pursuit the republicans had no time for an ordered retreat and broke up into a number of smaller groups which would be harder for the British forces to pursue. Local farm labourers who had been making trams of hay near the edge of the bog when the running battle started helped carry the two wounded I.R.A. Volunteers to safety and sent for doctors to Milltown and Lahinch. The wounded were then placed on stretchers and carried across country to Moy. Patrick Kerin and Michael Curtain expected British forces to arrive in the area at any time and hid their rifles and the papers they had taken from the R.I.C. men’s bodies in a stone wall near Molohan’s house. It was now after four o clock and the British military had sent for reinforcements as soon as they had arrived at the ambush site at Rineen two hours earlier. O Neill and Curtin were the only I.R.A. members were wounded in the withdrawal though neither was wounded seriously. However the British forces suffered much heavier losses, in addition to the six dead members of the R.I.C. a number of British soldiers had been wounded including a Royal Army Service Corps driver. 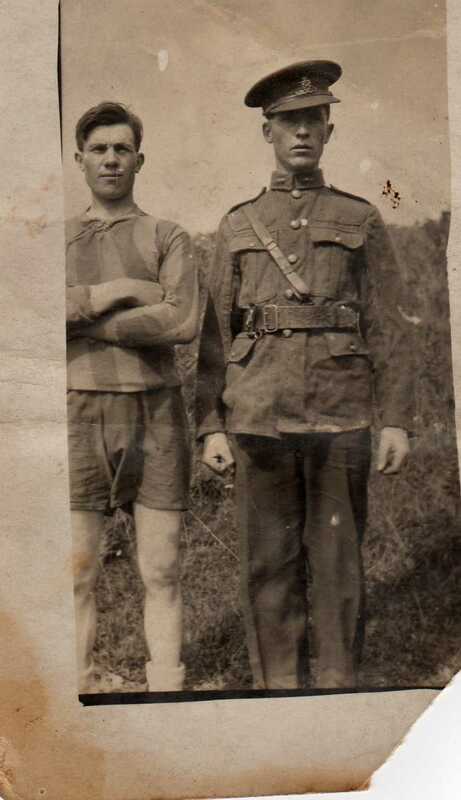 I have a picture of my grandfather, in what is described as an IRA uniform (he is from Fermagh) is this Fermanagh?. I am in the Canadian Military, and to me the cap badge he is wearing is an artillery badge. If possible could I send an email attachment of this picture to you, and if you would be so kind as to provide me with any feedback on what type of badge/uniform he is wearing. Thanks, regards. Aaron Quigley. http://theirishwar.com/wp-content/uploads/2013/10/irish-war-logo1.png 0 0 admin http://theirishwar.com/wp-content/uploads/2013/10/irish-war-logo1.png admin2010-11-20 13:40:522011-02-11 15:33:51Volunteer Quigley, any info?